I've planned, researched, anticipated and watched the weather for weeks. The Lake Louise Double Tea House hike has been something that I've been interested in since last year. Finally, the time arrived. Ron and I left on Sunday afternoon and headed to Canmore where we would spend the night. 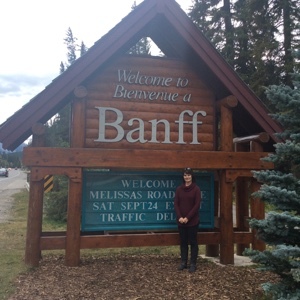 We went into Banff since our granddaughter, Sarah, told me that if I was going on to Lake Louise I should go to Banff too. We had a delicious dinner at a wonderful Greek restaurant and sampled some chocolate at one of the homemade candy stores along the beautiful city of Banff. Ron and I enjoyed a relaxing evening and then headed back to our hotel in Canmore with tea in hand. Ron had watched too many tourists posing! The next morning we travelled to Lake Louise and did lots of people watching while we waited for our hiking partners to arrive. We were asked to take pictures for the many tourists enjoying the beautiful morning along this beautiful lake. Once our hiking team showed up, we were off...5 adults and 3 dogs. Rachael had worked all night and then come on the hike but you would never know with how fast she went up the hills. The 3.5 km trek up to Lake Agnes Tea House was definitely a good work out but the views along the way were well worth my heart rate of 170. Rachael and I enjoyed a tea and a hot chocolate while the dogs cooled off in the lake. No electricity. Supplies are brought in by horse back. We stopped along the path and ate our lunch while we soaked in the scenery and sun. The trail between the two tea houses was a good work out again and not as busy. I think we had the nicest day of the fall to enjoy the hike. Slowly we made the last steep steps to the Six Glacier Tea House and found a picnic table where I enjoyed my birthday cake. Ron and I shared a delicious piece of an old family recipe from the tea house. It was a great stop. The baker for the cake...an old family recipe. My first birthday cake....boy, did I have to work for it! We continued up the path another 1.3 km to get a good view of the Victoria Glacer. The sun shone bright and warm and we could hear the rumble of avalanches. Since Ron was taking most of the pictures for the day he decided he should do a selfie. We headed back to the tea house and then began our 6.1 km hike down to Lake Louise. Careful steps were important due to the steep decline and it was important to stop once in awhile and take a good look around at the beauty from where we had been to where we were headed. Our hike took us close to 6 hours and I burned 2304 calories. It was a wonderful day and a great work out. We concluded the day with a pizza dinner in Canmore. I figured I deserved it after a 16.1 km hike! 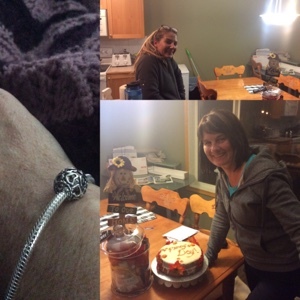 We stopped at our son's house on the way home and Rachael gave me a wonderful gift of so many fun gifts. We were too full to even sample the cake which meant I got to enjoy it today instead. A wonderful birthday hike...fantastic weather, good hiking partners, amazing views and tea! Today....I've soaked in the tub and am moving slowly. So glad we are going to Andrew and Brianne's for supper. The hard part will be getting there.